We are a couple of days behind getting this out but our days have been full of fun site seeing and the hassle of getting this all set up and connected to the internet has moved it down the priority list. Better late than never! It’s Friday and our first day that we’ve had a relaxing morning; we slept in, enjoyed a leisurely breakfast at our lovely boutique hotel, and scoped out the highlights of our last day in Chiang Mai before heading to the islands. We are touring the moated old city and visiting the important temples. We have really enjoyed this city and both agree we could have spent another couple of days beyond the site seeing to explore. 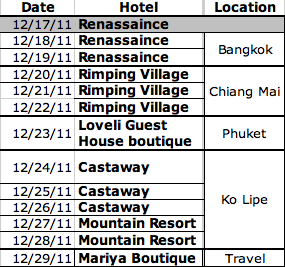 We planned a late evening flight to Phuket so we took advantage of the time and didn’t loose too much to traveling. The city has temples and scarttered throughout, more than you can count. Once we were out and about we wandered into our first temple grounds, well followed a monk in. Thinking it was a different, noted, temple we walked around and it felt so odd that we were the only ones there. The age of these places is really amazing, hundreds and hundreds of years old and still standing tall, just built around. Once we realized where we were we got back on track we made our way to the Three Kings Statue. The square was all set up for a Christmas party complete with an “ice” skating rink, huge snowmen made out of CDs, and christmas trees constructed out of plastic bottles – that’s one way to recycle. We made it to the oldest temple in Chiang Mai, Wat Chiangmun, built by King Mangrai upon founding the city in 1296. Next we walked to the main civic temple, Wat Prasingh, that sits on a huge campus with several living quarters and a school for the blind. While there, we were approached by a man that gave us a little insight to the statue at the front and that people present inscence as a sign of respect before entering the temple. While talking to him we were a bit weirded out, he asked us where we were from and when we said the United States the only three things he said about the US was “oh, you from Denver? You know Lockheed Martin? and do you ski?” We were so surprised we could hardly respond. Then true to our western skeptical ways wondered how the hell he knew that. He brought his family from Bangkok to visit the temples after the flooding and get some new suits made since several of his were lost. He gave Chad a tip on a good tailor and we were disappointed we didn’t have enough time to have some tailoring done. He also said we must visit one additional temple that wasn’t on our list, the detail is quite amazing and needs to be seen. So we headed off, out of the moated city and off the beaten path. The tourist map we had was not very good and we were turned around several times throughout the day. We twisted and turned and finally walked through a school and stumbled upon Wat Srisupan, a beautiful silver and incredibly detailed temple. Women are not allowed to enter this temple as their entry could cause demise to the temple and to the woman. To round out the day we found our way to Wat Jediluang, home of the City Pillar and large Buddhist university. Here we were just in time for the evening chant with the students from the university. As the sun set we wandered through a market as they were setting up and grabbed a snack before going back to the hotel for our ride to the airport. The food has been amazing so far but I still haven’t had my chicken on a stick yet. We had a fairly uneventful flight to Phuket. It was delayed so it turned into another really long day and we exhausted when we finally arrived at our guesthouse. The Loveli Boutique Guesthouse was not that loveli and didn’t come close to Rimping Village in Chiang Mai, good thing it was just for a short overnight before heading south. Phuket was still going strong well after midnight but raging has not been our pace and decided we didn’t need that kind of experience. This morning we took advantage of our jet lag and headed out early. Doi Suthep is Chiang Mai’s most famous temple; they say if you don’t visit Doi Suthep you don’t visit Chiang Mai. We arranged a taxi to pick us up at 0515 for the 45 minute drive up the mountain so we could make it for sunrise. We arrived and didn’t really know what to expect but were greated by two dragons at the entrance. The roosters were crowing but it was still dark as we began our ascent up the 300 stairs. At the top we took off our shoes, wandered in and was greeted by the amazing pagoda. We turned and found the monks chanting their morning ritual. We sat in back and soaked in the amazing engery; then, all of a sudden they stopped turned around and now we were apart it. We knelt, bowed and wai’d. It was moving, special, and an experience. When it was finished we made our way around then out to the overlook for sunrise. We sat perched over the city at almost 1700 meters and watched as the sun came up. What an incredible experience that we are thankful to have had. Our plan was to head up to the King’s palace an wander around but it was still early and not yet open for entry, so we headed back for breakfast. We didn’t have much of a plan at that point, thinking we may need a nap. At breakfast we decided to take advantage of the famous Chaing Mai spa’s. Chad, never having a spa experience didn’t really know what to expect; I was glad he agreed to go. I wanted everything on the menu but choose a foot scrub, oil massage package but added the traditional thai massage. Three blissful hours! I felt like a whole new person, Chad just felt sore. Well worth it but I’m not sure Chad will ever indulge in another Thai Massage, guess that means more for me. Since we headed to the spa in liue of a nap we made it back just in time to get cleaned up for our cooking class at Siam Rice. We were picked up in the red taxi and made the rounds to collect the rest of our fellow classmates. In addition to us, there were two young men almost our age traveling Asia for a couple of weeks and 4 college students on a volunteer trip. Being the oldest of the group and considering everyone was American, it wasn’t exactly what I expected but not entirely surprising. Our first stop was the market where we were introduced to the ingredients and wandered around. Siam Rice is hosted at “Nancy’s” house where the family welcomed us in. We all choose four dishes that we wanted to prepare and enjoy; we picked hot and sour soup / hot and creamy soup, drunken noodles / fried glass noodles, cashew chicken / chicken ginger, and of course curry – Green curry and Chad braved the most spicy of them all the Jungle Curry. We were stuffed and in awe that we each did so well to produce such a tasty meal. I hope we can do it when we get home. The Jungle Curry was so spicy, by the way, Chad had about three bites before passing it around the table testing who else was man enough to try it. I proud to say no one else made it past one bite. We were exhausted but wanted to get the souveniers we spied at night market so we were full steam ahead – well half (or quarter) steam. We made the round, shared a bit of ice cream and it was time to call it. We still had Friday to explore the old city square and it’s many temples before heading south so we needed to rest up. We arrived early evening on Tuesday and were able to take a walk through the night market and get a feel for Chiang Mai. We Immediately felt how polite and laid back the people are here and enjoyed looking around at the local items. We stopped by a food cart for some dinner, watched some traditional Thai dancing and took note of souveniers we may want to bring home. After the exhausting five days of travel it was time for a bed, it had afterall been since Seattle (two nights) since we’d slept in one. After missing the first few travel days and bypassing Bangkok, we jumped right into our planned activities on Wednesday morning. We were picked up at our hotel and headed a little over an hour out of Chiang Mai to the Elephant Nature Park. Chiang Mai is the second largest city in Thailand and it was nice to get a little perspective of the area. It was a beautiful drive in, ENP is the farthest park out on the remote road up and over the rolling hills. The weather was beautiful and we laughed at the big coats and scarves everyone was wearing and how cold they talked about it being, this is their winter so I can’t imagine how hot it gets in the summer. 36 Asian Elephants roam free around the park, 32 females and 4 males, not to mention the dozen or so dogs, oxen and one bear. We were given a tour of the grounds and headed straight out to the clinic where we met the first two rescued gentle giants. ENP is run by an amazing Thai woman who is on a mission to save mistreated and beaten elephants and educate people how to teach with love and positive reinforcement. They staff their own vet and travel all over the region providing medical treatment where needed. The first two we hand fed and were amazed at the recovery they went through and the strong bond between them. One of them was locked in chains and forced to breed; the weight and brutal lock broke her hip and part of her back, it’s amazing she’s walking and still alive. The other elephant was beaten and blined in one eye and immediately bonded with the broken girl when she was brought to camp. They never leave eachother’s side, a true testiment to how inteligent, caring and protective these animals are. Elephants eat 10% of their body weight a day, or 250 – 400 pounds, and spend their 18 waking hours chewing. Needless to say we had a lot of feeding to do, good thing they have a big elephant kitchen full of pumpkin, bananas, and watermelon. Then it was bath time to cool everyone down so we headed out to the river with our pails and splashed away. Lunch time was a great spread with more choices then we could even try. The highlight was the spicy papaya salad, so delicious. After we refueled it was back to feeding the elephants again. The afternoon was mellow and we were able to just spend time with the amazing creatures. We met the two babies, got kisses and watched playtime in the mud. There are two documentaries on the park and the work the owner, Lek, continues to do. It’s amazing how highly regarded the elephant is, both in work and religion, and what a part they play in Thai culture yet how poorly treated they are. A centuries old tradition to “break” the animal’s spirit and “teach” them who is master is still actively practiced and hard to hear about. The laws are complicated and rarely enforced. Domesticated animals have no rights here and that speaks for the working elephants. The wild elephant population has decreased 95% over the years mostly due to logging. Since the 1980s when logging was made illegal most working elephants were out of a job. Tourism has become their new job and they’re now subject to begging in the streets, giving rides and performing circus tricks. It was important to us to find and support a rescue program where the focus was on elephants and treating them as special as they are. Well, our first day was a great success! We had such a great time and loved every minute of it. We ended up with about 300 pictures so looks like we will have enough to document the experience. We have been trying to figure out how to start this post for a few days now and keep saying ”we will write it when we get there”, well five days later it is time. The past four days have truely been a test of our creativity, flexibility and sense of adventure. The challenges of standby flying have certainly showed there teeth, all starting in Miniappolis, MN on Friday, December 16. Our spirits spirits were high taking off Friday morning from Reagan National Airport where our plan was to be in Bangkok by Saturday night after routing through Tokyo (Nirita) Japan. The flights looked wide open the night before and we felt confident we’d make it with no issue; however, when we arrived in Minneapolis the flight booked up. As we watched the plane pull away from the gate we were dissappointed but kept our spirits high and told the gate agents we’d see them the next day. I had never been to ‘Mini’ and being just a few miles from the “Mall of America” we couldn’t turn down a rollercoaster ride inside a mall. Tom and Barb Schomer, some great friends of the Sittig’s, live in Mini so Fran gave them a call to see if they were in town and wanted to grab some dinner with us. After a few hours, Katie and I walked around the Mall of America, saw some amazing Legos, had dinner with great family friends and found ourselves at a diner called Dulono’s listening to a bluegrass band. One of the great things about standby is although you risk getting “bumped” it is what you do with your unexpected layovers that make them adventurous. We woke up on Saturday, December 17th excited and confident we would get on the flight to Tokyo, but upon arrival saw the chances were getting slimmer by the minute. We milled around with several other non-revs and a few of the revenue passengers that didn’t get on and considered the options. With the flights not looking any better in the next few days we decided to keep moving west and head to Seattle. We hoped that since there was at least one positive seat showing (and several still available to sell) that was better than other any other departure city across the US (they showed overbooked already). Since we gained a couple of hours we landed with some time to wander and opted to change our Bangkok Marriott reservation to downtown Seattle. Not what we had in mind but, not a bad place to stay overnight. We had a nice dinner and laughed at the place we ended up at. A bit more stuffy than our usual style, but we laughed at our goofey bartender and the guy who pointed out that he looked exactly like guy from Fargo that ended up in the wood chipper. And hey, the view from our room was nice! Third time a charm?! we rode the Light Rail Link back to the airport and hoped we would get on the flight to Tokyo, surely we would have better luck this time. But luck has not been on our side this weekend before Christmas and we found ourselves extremely disappointed again (at least we didn’t miss an $8k tour like another family flying standby, figure that one out). After analyzing the flights and departure cities we decided that we needed to figure out an alternate route. The best option appeared to be Beijing China, at least that got us to Asia where we could continue on to Tokyo then Bangkok. After some quick research by Bud we realized that China requires a visa to get into the country, unless you have a purchased onward ticket – standby in China is not an option. So we decided to look for an Asian carrier that could also provide a more direct route. During all this we met another couple, Stefano and Britt, who were on their first trip together, first international trip and first standby experience all in one – we were all glad to be in this together but I think they were more glad to have someone take the lead. The gate agent who made their itinerary change was under the impression that the standby listing would be considered an onward ticket and no additional flights were confirmed. As boarding time approached it came to our attention that without an actual confirmed onward ticket we could not board the plane. That left one option, buy a full fair ticket from Beijing to Bangkok. Now the challenge here is we still had not been cleared with a seat, it looked good but still a gamble to buy tickets. We were also required to provide proof to the gate agent who wasn’t sure a reservation would be enough. With 40 minutes to push back we got the word we would be cleared and the fury to buy tickets began. We borrowed a computer from a Chinese passenger who was about to board and started pulling up all the options we could, but couldn’t seem to get what we needed. So Katie called Bud in the middle of his birthday party to help out. In the mad dash and only 15 minutes before they shut the door we frantically relayed all four of our information over the phone. We boarded the flight with an email confirmation on my phone and enjoyed the 12 hour flight to Beijing in first class. Dinner and drinks were just what we needed before laying down flat in our cushy Boeing 777 seats and sleeping for 9 hours of the flight!! After three hours of chaos in the Beijing Airport the four of us boarded the plane and everyone was finally on the same page about where we were getting to where we were going. We arrived safely in the Philippines, when we got off the plane we immediately felt more relaxed and glad the people were so friendly. Only two flights left before reaching our final destination Chaing Mai, Thailand but everyone was feeling it and ready to be there. At this point we lost a few days in Bangkok but wasn’t cutting into the core of our trip so our spirits remained high. 4 days, 7 flights and 27 hours of flight time later we finally made it – safe, sound and loving it. Katie and I completed our Scuba refresher course on the morning of December 11 and feel 100% more comfortable to jump into the ocean and explore the under world of Koh Lipe. We decided to travel with just carry on bags so that meant cutting down on our “extras”, although we did fit quite a bit into our in frame pack and a small camera bag. Now, we are sure glad we get to wake up and head out on an amazing adventure, tonight’s been a bit of a rocky start. After a lost kindle and a disappointing final grade we are looking forward to the upside. We should arrive in Bangkok just before midnight on Saturday. Here’s our itinerary, so excited!